Everyone wants a wedding ceremony that is unforgettable and unique. A celebrant led ceremony gives you the freedom to choose exactly how you want your day to be and ensures your ceremony will be personal and meaningful. As a celebrant I will create a ceremony that reflects your personalities. The words will be about you and the readings, vows and symbolic ceremonies, such as the lighting of candles or tree planting, will be suited to who you are. Ceremonies can also include elements of different faiths and cultures - great when two people are from different countries. You can also have a non-religious and secular ceremony, or include spiritual or religious elements. Using a celebrant also means you are no longer restricted to using registered-only venues, so your choice of wedding locations increases. You can get married anywhere...a marquee, a yurt, a beach, woodland, a castle, a mansion or a hotel. If you're looking for something a little different to a church service or registry office, a celebrant may be for you. Whether your wedding is small and intimate, or a big party, I can create a ceremony that is suited to you. Please get in touch to discuss your ideas and requirements. I am also able to create a handfasting as part of your wedding ceremony. 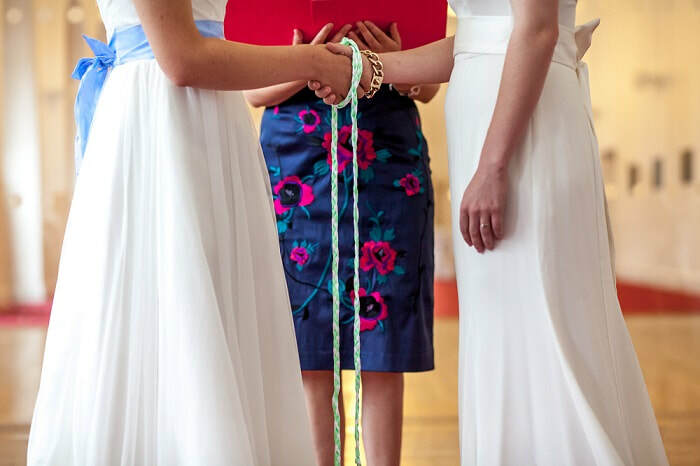 A handfasting is based on an ancient practice popular across Britain and Ireland which involves the tying of ribbons and cords around the hands of the bride and groom to symbolise unity (and may be where the expression 'tying the knot' comes from). A handfasting can be either spiritual or non-religious and provides a unique and memorable moment in your wedding blessing or ceremony.